Water, fertilizer, and oxygen are all critical components of a healthy lawn. 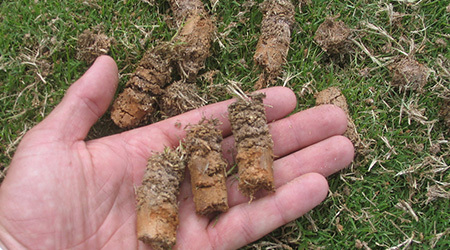 Lawn aeration is a service that increases roots exposure to these essential elements, breaking up compacted soil so that vital nutrients can best penetrate the root zone. While compacted soil is not unusual, it is problematic — it causes unhealthy roots and a myriad of other issues. Poor lawn maintenance, hard clay soil, or heavy foot traffic could be factors that contribute to lawn compaction problems. We will analyze your lawn and make recommendations based on soil quality, ensuring the best possible approach to soil cultivation. Aeration reduces water run-off and puddling. Aeration helps strengthen grass roots. Aeration improves the resiliency of your lawn. Aeration helps make a thicker lawn. Visit our Resource Center for more information about Lawn Aeration Services and more.